Town Hall Gallery is pleased to announce the five artists commissioned to create new works for its Another Look exhibition, which will take over the gallery from 28 October to 20 December this year. Vivian Cooper Smith, Dana Harris, Siri Hayes, Tai Snaith and Kylie Stillman have been selected from over forty applicants to produce new work inspired by the Town Hall Gallery Collection, which comprises not only artworks but also historic and civic memorabilia from the City of Boroondara. Tai Snaith says, “I was drawn to Another Look because it was unusual, but when I started looking at what there was in the Collection, I was particularly drawn to the Helen Maudsley paintings. Helen is a total legend and it is a huge privilege to make a new work responding to her work. I hope to meet her and interview her as part of my process, which is really exciting. The exhibition continues Town Hall Gallery’s commitment to artist commissions, following on from past commissioning opportunities including, in 2015, the responses of three artists to the work of Ronald Greenaway as part of the retrospective Ronald Greenaway: The Artist and His World. For Another Look, the five artists have delved into the history of Boroondara across the Art Collection, History Collection, Local Government Collection and Public Art Collection to find items, aspects and elements that will drive their contemporary responses. Over the coming months, they will create new works inspired by their chosen Collection items. Another Look will offer audiences – and the selected artists – new ways of seeing and interpreting historical works and cultural objects. The resulting exhibition will feature items from the Town Hall Gallery Collection alongside the new works that they inspired. 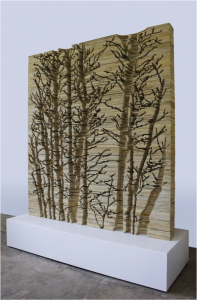 Dana Harris says, “Connecting disparate information and elements encourages me to work in an open-ended way, with variable possible outcomes becoming clear as the process unfolds and components share their relationships to one another. Spanning three gallery spaces, Town Hall Gallery features a diverse range of contemporary public pro-grams, curated exhibitions and exhibitions drawn from the Town Hall Gallery Collection, celebrating the rich cultural heritage of the City of Boroondara. Part of the Public Galleries Association of Victoria, Town Hall Gallery supports local, national and international artists at varying stage of their careers, and offers a space for local artists and community groups to exhibit professionally on the Community Project Wall. Image: STILLMAN, Kylie, Cypress Pine (2012), 201 hand cut fence palings, 240 x 180 x 15 cm, © courtesy of the artist and Utopia Art Sydney.